Two years have passed since I repotted the pinetree bonsai. 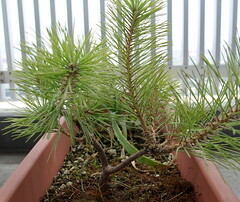 It is growing healthily but now it has too many branches for a bonsai; it's time to prune. I always see *life* in this pinetree; it grows in summer; it says it's freezing in winter; it even gets sick; and it smiles. But today I had to cut some of its arms and legs just for my own sense of beauty I see in this small universe in the planter. It hurts.